Slapstick Science is an astounding, exciting, and entertaining series of science assemblies and workshops which use the circus as a laboratory. 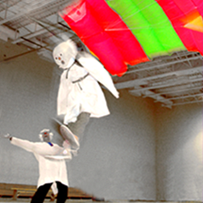 All programs are written and produced by certified science teacher and former Ringling Bros. performer, Ted Lawrence. Assemblies in physics and chemistry emphasize audience participation and are accompanied by Study Guides. Guaranteed to stimulate curiosities and motivate even the most science-phobic students to have fun with physics and chemistry. Ever wondered how a single person can lift a car or throw something heavy high in the air? Simple machines, Potential and Kinetic Energy comprise the physics unit taught in Much Work with Little Effort. How does a rocket take off? How long will it keep going? What is inertia? What is a force? Audiences who've seen The Notion of Motion, an introduction to Newton's laws of Motion will be able to explain. What should you do if your frying pan bursts into flames? Why doesn't a "fire eater's" mouth get burned? During October, Fire Safety Prevention Month, Combustion, a chemistry assembly for third graders and older, teaches fire safety through the chemical foundations of fire. What makes an airplane fly? How come the Wright Bros. succeeded where all before them had failed? By learning about air, thrust, lift, drag and weight - from some CLASSIC demonstrations presented in Dr. Quark's inimitable and incredibly fun style, audiences of "Flight!" will understand how the Wright used the discoveries of scientists preceding them for centuries to finally achieve the First Flight. What should you do if your frying pan erupts into flames? or what if there's smoke coming out of your dryer? Why do you have to get out of a burning house immediately even if there isn't any fire where you are? "Combustion - the Fire Safety Show" teaches the chemical foundations of fire so students can understand it and control it in real-life situations. This is our most significant show. Third grade and up. What is Chemistry? What are solids, liquids, and gases? Kiddie Chem is a fun, light-hearted chemistry lecture for K - second graders featuring liguid nitrogen, dry ice, exciting reactions, and the goofiness of Dr. Quark. Slapstick Science © 2019. All Rights Reserved.